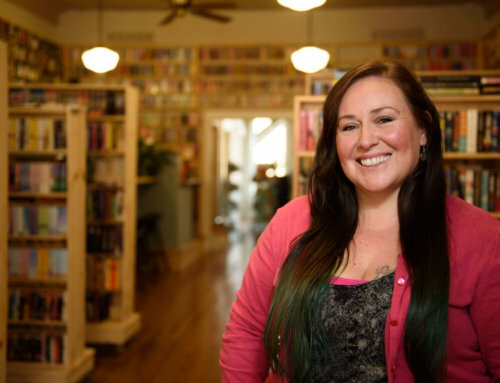 Lisa Greene went to school to be a teacher, but with so much baking in her blood, it seems only natural that she has found herself running a bakery instead. Greene’s great-grandmother ran a bakery in Germany before immigrating to the United States and working as a cafeteria lady. Greene grew up making cakes and cupcakes with her mother in their family kitchen. She taught herself how to decorate with fondant when she was 16 and soon started making custom cakes for family and friends. Her aunt Kelly Bowdoin and cousin Ashley Stone opened Mini Delights Bake Shoppe at 217 S. Main St. in downtown Elkhart in 2009. Greene worked at the bakery off and on over the years while she studied to become a teacher, and eventually left when she graduated college. In 2015, Mini Delights ended retail hours to focus on catering and large orders, but fans of the bakery clamored for a comeback. Greene was looking for a new teaching job when her aunt called her and asked if she wanted to make cupcakes for a living. 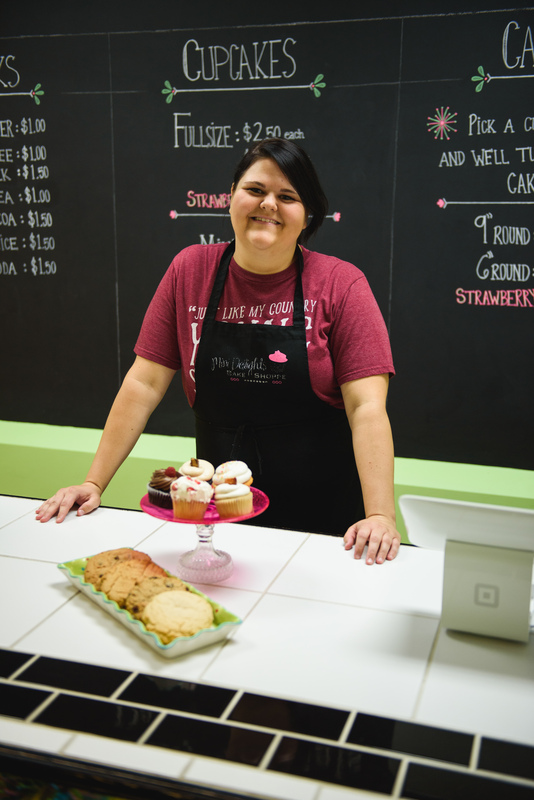 On Sept. 15, 2015, Greene and her brother Steve became the official owners of Mini Delights. The bakery’s fans were overjoyed. "The first day was insane. We had to have had probably 200 or 300 people come through, even just to say, ‘Hey’ and visit with us," Greene said. "That first week honestly is a blur because we had hundreds and hundreds of people show up from Elkhart. People were very excited to see us open the doors back up." Greene now spends at least 12 hours a day at the bakery, baking up delicious cupcakes and gourmet cookies and chatting with customers. It’s a lot of work, but it’s exactly where Greene wants to be. 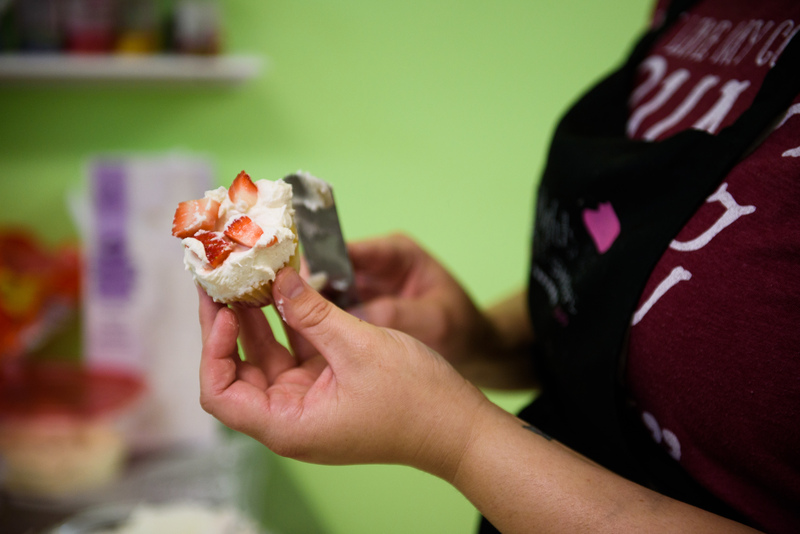 Lisa Greene frosts a mini cupcake with Mini Delights Bake Shoppe’s popular fresh strawberry icing. Photos by Jason Bryant. "I’ve always been a baker. The kitchen is where I am happiest. I get to create stuff," she said. "It was easy for me (to take over the shop) because I had always played with the notion of opening a bakery of my own. But I was hesitant because my aunt owned a bakery, so when this opportunity came, it was perfect." Getting started was a challenge, but eventually Greene learned the flow and has been able to expand the bakery’s menu. She can take more custom orders for events and weddings, including custom decorated cookies. She’s also been experimenting with different cupcake flavors. Specialty flavors include a Harry Potter-inspired butterbeer cupcake, a beer-infused chocolate stout cupcake and a refreshing margarita cupcake. Greene chooses once speciality flavor to feature each week in addition to her standard 12-flavor menu, all available in full and mini size cupcakes. Any of the speciality flavors can be ordered any time of year in full size or mini cupcakes or in cakes with advance notice and a minimum order. Cupcakes were all the rage when Mini Delights first opened, but their popularity has waned in recent years in favorite of pies and candy bars. That hasn’t impacted Mini Delights too much, though. Greene still gets orders for birthday parties and other events and she gets several orders every year to make cupcakes for weddings. 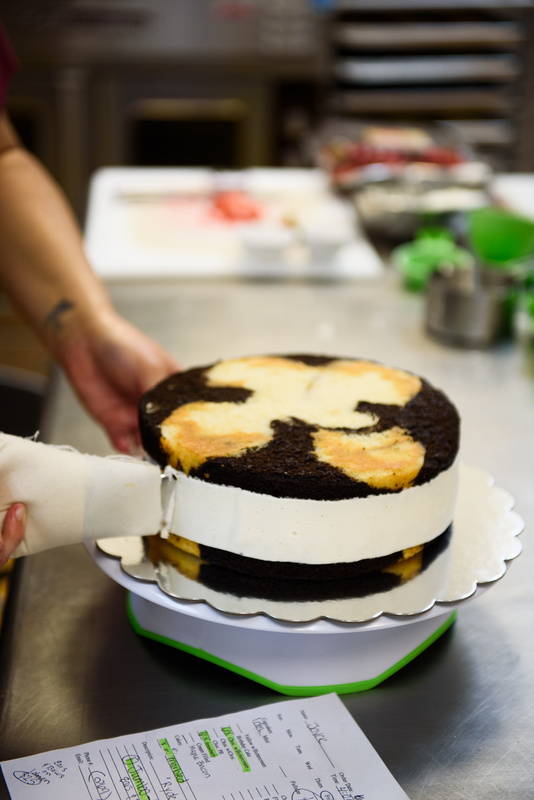 "A lot of people don’t want to have to deal with the mess of cutting sheet cake," she said. "Most of the people we get in here order because of the ease of cupcakes. You can set them out and people can help themselves." Almost two years after she took over Mini Delights, Greene is already looking at how the bakery can grow in the next few years. The shop will likely be remodeled in the next few months. Greene is working with her brother and students at Ivy Tech to design mockups. She’s also considering some sort of collaboration with the Kona Ice franchise her brother owns — perhaps a Kona cupcake. Whatever changes are coming, a few things will remain the same. Greene will always make full size and miniature cupcakes and cakes in a wide variety of flavors. She’ll always sell gourmet cookies, especially at Christmas. And she hopes to always be located in downtown Elkhart. "I grew up in Elkhart. My brother grew up in Elkhart. We’ve always been involved in Elkhart events. I know when my aunt originally opened (Mini Delights), she had a lot of pride in downtown Elkhart. And there’s growth happening here. We wouldn’t want to leave that," Greene said. Mini Delights opened as the Great Recession started to hit Elkhart and has been part of downtown Elkhart’s growth over the last few years. "Really within the last two years, we’ve seen the biggest changes. We’d never seen the flowers downtown before or the art work," Green said. "All these antique places and furniture stores and salons are huge. There’s not just banks and law offices anymore. There’s places to shop, there’s restaurants."